Patience and luck can yield enviable big-animal encounters. Get up close with sea creatures at the Port Townsend Marine Science Center. Check out the rest of our fall road trips package here. Sailing west across Elliott Bay on the Bainbridge Island–bound MV Tacoma ferry, I’ve already got my binoculars out, scanning the waterline for signs of life. An osprey shrieks overhead, but otherwise, the rolling sea itself is the only body in motion I can see. But I know a little patience will pay off as I’m just starting my long weekend odyssey to one of Washington’s wildest corners, the Olympic Peninsula, in search of iconic wildlife. We reach the other side, and I steer my VW past the ice cream shops, galleries and inns lining State Route 305 in the village of Winslow. Eager to get past such trappings of civilization, I step on the gas. There will be no stopping ’til Port Townsend, where I’ll hop a boat for a whale watching cruise. Another hour behind the wheel, and I pull up to the Puget Sound Express office and check in for an afternoon tour aboard Red Head, a speedy 56-footer with a nose for sniffing out the San Juan Island’s resident orca pods. After a safety talk from the captain, Pete Hanke, we shove off and head south toward Admiralty Inlet, where radio chatter informs us that some orcas have been spotted. Within 20 minutes, we’re the first whale tour boat to catch up with the majestic black-and-white killers. At first the whales are far off, but as we drift and watch, they make their way closer, and within another 10 minutes, five of them are swimming under and around our boat. Seeing these magnificent and graceful predators playing around our boat gives me newfound respect for the wonders of evolution. The whales begin to take their show “on the road” until they swim out of sight. “Mission accomplished,” Captain Pete exclaims as he begins turning the boat around to head back to Port Townsend, telling us that we are lucky to get such an extended visit with the whales, which are starting to disperse for the “season,” given the early October date. Diligence and patience on an Olympic Peninsula wildlife-viewing trip may yield views of Orca whales, Roosevelt elks and bald eagles. 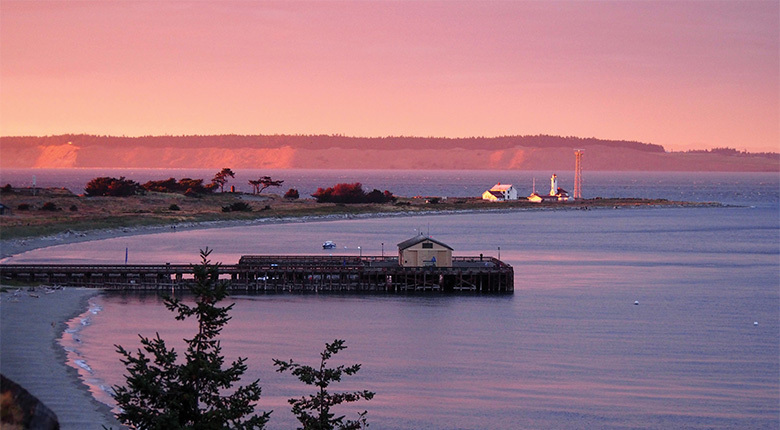 For that night, I’ve booked a quaint cottage on Officer’s Row in nearby Fort Worden, a former Army base dating back to 1902 that’s been repurposed into a more than 400-acre state park, complete with 2 miles of saltwater shoreline that serves as the focus of the Port Townsend Marine Science Center. I venture inside the science center and get up close and personal with some sea stars in the hands-on aquarium, and then listen in on some distant whales via hydrophone. The next morning, waking up early, I fire up the VW, grab a morning bun and cup of French roast at Pane d’Amore (the best French bakery west of Seattle) and head west toward my next stop: the Olympic Game Farm on the outskirts of Sequim. Created in the mid-1950s for the purpose of filming wildlife for use in Disney films, the facility is now open to the public and provides close encounters with an assortment of wildlife familiar and otherwise. Grizzly bears, llamas, yaks, bison, camels and zebras are among some 200 free-ranging wildlife species there, some wandering up to my car window as I wind my way along the park’s Game Farm Drive. The experience feels much more akin to a wildlife safari than a zoo visit, given the lack of enclosures and the proximity to the animals. I’ll never forget the sight of a retired Hollywood grizzly waving and clowning for me as I rolled by at 5 miles per hour. While the animals at Olympic Game Farm are certainly accessible, seeing them through the car window doesn’t yield the rush of spotting wildlife in the wild, so I keep heading west to try my luck at tracking Roosevelt elk—the largest of the four subspecies of elk still roaming the continent and whose protection was a key driver in the establishment of Mount Olympus National Monument (later Olympic National Park) back in 1909—in misty coastal rain forest. After driving for a couple of hours, I arrive at Hoh Campground, stake my claim at a riverside campsite and set out on foot into the woods with my camera in hand, picking my way over boulders and fallen logs, looking for signs of movement. I bushwhack in increasingly larger concentric circles around the campground for the better part of an hour to no avail, and finally give up my search and head back to my campsite to eat dinner and call it a night. Within another hour, my belly is full, and I crawl into my tent, looking forward to my slumber in the dewy confines of one of America’s quietest places. I read a chapter of my book and turn off my headlamp. Just as I close my eyes, I hear the sound of branches getting trampled somewhere in the forest. If you encounter mountain goats and other wild animals, enjoy them from afar. Whales and elk aren’t the only wild beasts worth looking for in the Olympics. Some 300 bird species—from grouse to warblers to woodpeckers to jays to auklets to eagles—make use of the diverse habitats of the Olympic Peninsula, so bring your binoculars and a generous supply of patience. With good luck, you might even catch a glimpse of a marmot, a black bear or even a mountain goat (find more wildlife viewing details at nps.gov/olym). But keep your distance: In 2010, a Port Angeles man was fatally gored by a mountain goat along a hiking trail in the high country near Hurricane Ridge. Always give wildlife some space and don’t be foolish enough to try to get closer for a better photo or even worse, for offering a human-food handout. You'll likely see some of the area's famous precipitation on this drive; soak it up with these songs on the subject.